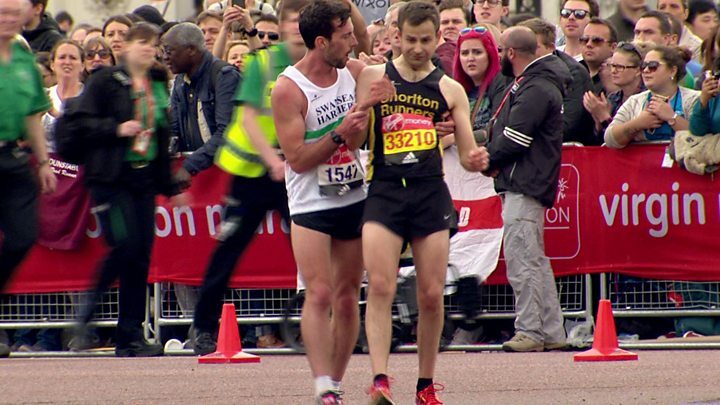 A London Marathon runner who helped a competitor finish said he was just lending a hand to a "guy in need". Crowds - including Prince William - cheered on Matthew Rees as he stopped 300 metres from the end to help David Wyeth. Swansea Harriers runner Mr Rees told the Chorlton Runners athlete: "We'll cross the line together." Race officials tweeted: "You've just encompassed everything that's so special about the #London Marathon." Mr Rees said: "I came round the final corner and I saw a runner struggling, his legs were collapsing beneath him. Every time he tried to get up, he kept on falling back to the ground. "I went over to him and said 'come on, you can do this' and tried to gee him up. So instead of continuing with his own run, Mr Rees helped his fellow racer to his feet and walked with him to the finish. "I said 'come on - we can do this - we'll do it together, we'll cross the line together," he added. Mr Rees said he was not worried about his race time, he just wanted to ensure they both finished the event - and still under three hours - "if we could just get to the line," he added. "So I put his arm around mine and we walked it to the line. The crowd were incredible, they were cheering us on." Those present included the Duke of Cambridge and Prince Harry who applauded as both Mr Rees and Mr Wyeth finally crossed the line. The pair finished in 2hr 52min 26 sec - with Mr Rees losing scores of places in the race running order to come 986 in the men's overall. Runner Mr Wyeth said: "For someone just to stop their own race to help you, that's such a decent thing that he did. "I was urging him to move on, you know please don't sacrifice your race for me. But he stuck with me and I think a volunteer also joined me on the other side. "I just helped a guy out when he was in need. I'm glad he got to the line, and I'm glad he is okay," he added. "That spirit, it encompasses what running is about and what the marathon is about."